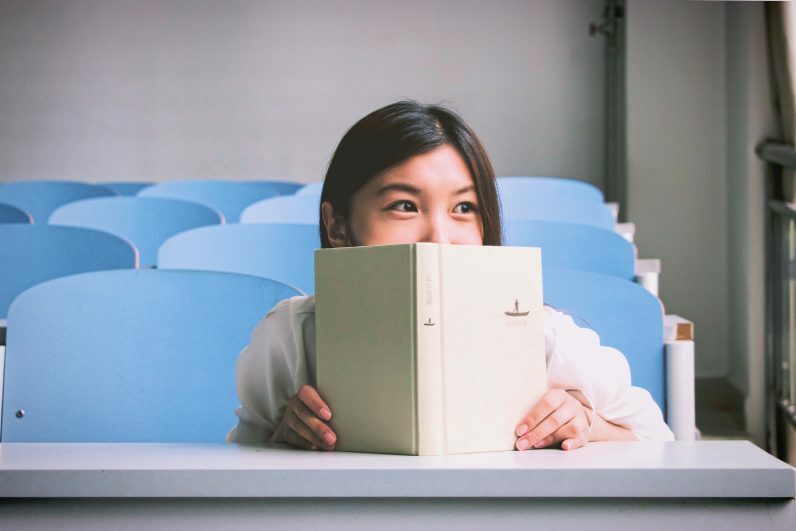 A little while ago, the European Parliament recommended a list of 8 key competencies which they believe all educational institutions should provide their students with, to promote lifelong learning. These key competencies consist of knowledge, skills, and attitudes which are central to the development of well-rounded children, young people and eventually adults. It’s hoped that taking a cross-curricular approach, known as phenomenon-based learning, will support the development of a cohesive and engaged society, made up of active and knowledgeable citizens. It’s a big aim, but across the world, education specialists are getting on board with this approach to lifelong learning. Finland isn’t the first country to recognize the value of ‘lifelong learning’ but Finland is the first country to base their teaching curriculum around the eight key competencies. Instead of focusing on classic academic subjects, like History or English, Finnish schools will now structure lessons around broader, cross-cutting and interdisciplinary “topics”. As Professor Sahlberg explains, the key competencies don’t focus on knowledge acquisition and test score results, but on developing skills for longer term learning, with an emphasis on social and emotional development. So there’s a run down of the theories behind the key lifelong learning competencies. Communication skills are hugely important in enabling children and young people to both express themselves and develop positive relationships. They’re also important for employability. A UK study found that 98% of business leaders think communication and teamwork skills are necessary for people entering the workplace. However, only 32% believe that schools are doing enough to equip pupils with these lifelong learning skills. This competence covers written and reading comprehension too. It’s been found that mind mapping offers a more natural way for the brain to absorb and comprehend information, in comparison to linear text. To develop the language skills of students, try using this reading comprehension template map with students. This mind map will help to break down the different aspects of a book you’re studying. You could create a similar mind map collaboratively in class, to develop your students’ spoken communication skills too. 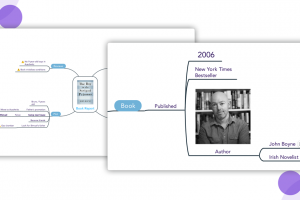 To use any template mind maps within this article, simply sign into MindMeister (or sign up free) and maximize the map via the ‘map actions’ icon. Once maximized, click again on the ‘map actions’ icon and choose to clone the map. From there, you can edit or embellish the topics to make the map suitable for your classroom’s age and stage. 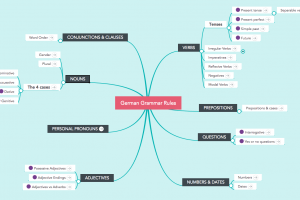 As explained previously in the MindMeister series, How to Learn A Second Language with Mind Maps Part 1 and Part 2, mind mapping is the ideal way to develop proficiency in a foreign language. By presenting information in a visual way, mind mapping has been found to improve memory retention. As a result, mind mapping makes the lifelong learning skill of acquiring a second language easier, faster and more fun. For your next language lesson, set your students the task of creating a mind map on learning conversational vocab at their level. Ask them to create a topic for each key category such as food, clothing, directions, shopping etc. and try including visual cues that students can then associate with the new words. Acquiring foreign languages will hopefully be something your students will go on to do throughout their lifetime. By providing them with the skills to learn foreign vocab now, you’ll subsequently provide them with a lifelong learning skill, which they can go on to utilize in both the workplace and for holidays abroad. Introduce mind mapping in your classroom! Science and maths can be unfairly branded by students as boring subjects. However, it’s really important that students leave school with at least a basic level of arithmetic to navigate everyday situations. Similarly, students must develop the lifelong learning skill to analyze studies and methodologies. 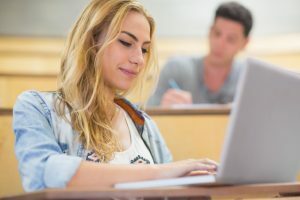 With the breadth of inaccurate news available online, it’s essential that students are able to critically assess whether information is neutral and well-grounded. If you’re trying to make science and maths seem more fun, try asking students to create their next lab report and methodology study via a mind map. You could provide them with the template below or ask them to create their own from scratch. The development of technology and access to the internet has brought huge opportunities to our children and young people but has also brought threats. As a result, this competency is not only about developing the Information and Communication Technology (ICT) skills of students. It’s also about providing them with the skills and knowledge to be responsible and critical internet users. 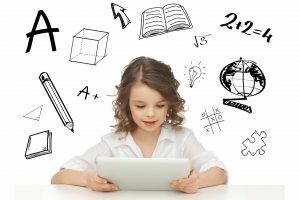 By utilizing mind mapping as a digital learning tool, you will develop your students’ understanding and abilities in ICT. This will enable students to not only create mind maps but to learn to collaborate with class mates on their maps and create engaging presentations. In order to develop your students’ understanding of how to use the internet critically and responsibly, try using ChildNet’s free online safety teaching resources. Ask students to create a collaborative mind map on the projector focusing on one of the topics mentioned. For example, they could present on how we should think carefully about what we share publicly over social media channels. Subsequently, this lifelong learning competence should help to keep your students safe while navigating the online world. Your browser is not able to display frames. Please visit Staying Safe on Social Media on MindMeister. As Jesse Berg, visual learning specialist, recently explained in his article on differentiated learning, mind mapping provides a universal thinking strategy which enables students to organize ideas and can be applied to just about any topic. By laying out text, concepts, themes and connections in a visual and colorful way, mind mappers utilize their visual, spatial and kinesthetic senses. Jesse Berg found this makes learning easier to understand and information easier retain. 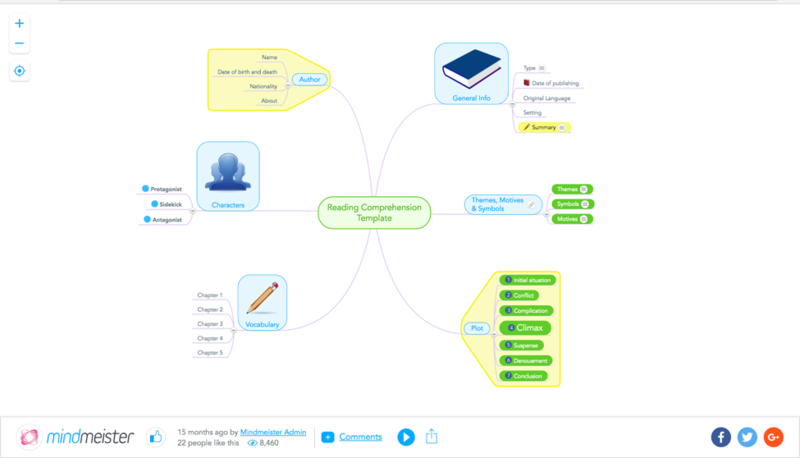 By teaching your students how to mind map you can support this lifelong learning competence. Mind mapping provides your students with a fun, easy and memorable method which will help to instill a love of learning in your students. One lesson idea for developing this competence is to ask students to create a mind map on study skills in class. Ask students to insert a YouTube video on study skills at the center of their mind map. This can be done via the video insert feature on the MindMeister sidebar. Students can then press play on the video in the center and create topic branches based on the content of the video as it plays, ultimately creating a useful study resource. Your browser is not able to display frames. Please visit The 9 Best Scientific Study Tips on MindMeister. These competencies refer to an understanding of key structures and values such as democracy, justice, equality, citizenship and civil rights. The competencies aim to develop the personal, interpersonal and intercultural abilities of students, providing them with the lifelong learning skills to be active and ethical citizens. For this type of highly personal learning, which could bring up family stories and vary depending on socio-economic situations and beliefs, it’s important that you first create a safe learning environment. The aim is to create a classroom environment where students will listen to one another and know only to disclose personal information and worries when appropriate. In this case, directly to the teacher rather than in front of the whole class. It’s also important to ensure your teaching begins at your students’ level, in terms of prior knowledge. To begin a class focusing on this competence, create a mind map on the projector based on the topic you’re looking to cover. Then, invite students to add details on what they know about the topic so far. You could make each topic on the map a question you’re looking to establish their current understanding on, then ask pupils to contribute what they already know or believe. Your browser is not able to display frames. Please visit Human Rights on MindMeister. A sense of initiative and entrepreneurship will assist your students in becoming creative, proactive and well-organised young people. This competence should also provide the lifelong learning skills to succeed in the workplace. Try setting your students an entrepreneurial task where they work in small teams to come up with a product. The product should cost less than $5 per item to produce, but students should feel they could either make a profit or support a social cause. Ask them to create a mind map and share it with their whole team, so everyone can contribute to the map. The map should include their research, justifying why the product would have a Unique Selling Point. It could also include details of how they plan to produce and market the product. The groups can then take it in turns to present or ‘pitch’ their idea to the rest of the class. 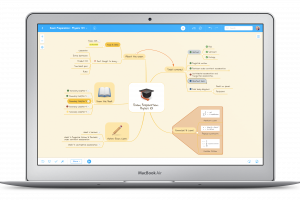 Your students could use MindMeister to vote on which product they believe to be the best idea. Your browser is not able to display frames. Please visit The Big Idea on MindMeister. Creativity and cultural awareness go hand in hand. In order for students to appreciate the value and enjoyment of music, performing arts, literature and visual arts, why not encourage your students to learn about these exciting topics in a creative way. Organize a school trip to a local cultural event, such as an age-appropriate film festival or a Shakespeare theater performance. Ask students to write down their thoughts and reflections for homework. When back in class, ask your students to create a mind map, detailing their opinions on the performance. These could include cast members, character relationships, key themes and perhaps notes on the accompanying music, in order to form the basis of a newspaper review. Ask them to then export the mind map, to convert it into a word document and finalize their review with a headline, subheading and a 1 to 5-star rating. To export a map, simply open the map and click on the bottom right-hand cloud icon. You can then choose the format you would like to export the map in, for example as a Word document, shown below. 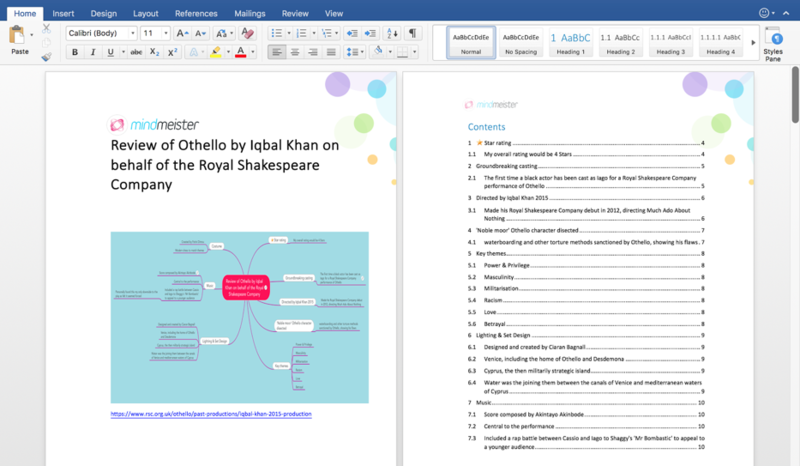 The below Word document was exported directly from this mind map review of Othello, directed by Iqbal Khan. So those are our suggestions on how to bring the eight key competencies for promoting lifelong learning, known as phenomenon-based learning, straight to your classroom. As always, if you have any ideas, questions or comments, please do share them with us in the comments below!